With flowers that look like Chinese Lanterns, Sandersonia are a brilliant little bulb that has a climbing habit. It flowers in summer and in good conditions will multiply in the garden over time. 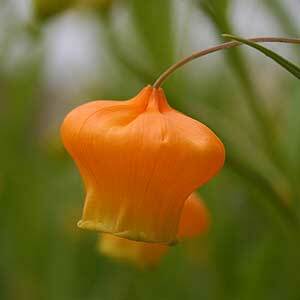 Sandersonia aurantiaca (pictured right) is the only one of the species, attractive hanging orange lantern like flowers. Sandersonia aurantica grows well in a well drained soil in a sunny position. Also referred to as Christmas Bells, Sandersonia aurantica will reach nearly 1m and is originally from Southern Africa. Sandersona can be grown from seed, but bulbs are readily available for sale from online nurseries in Australia. Other than a sunny position and good drainage these bulbs need little care and can be grown in pots or containers if desired. Plant with the top of the at around 25 cm deep with the growing points slightly deeper. Water in well with a liquid seaweed fertiliser and then refrain from watering until new growth is evident. Once the flowers have finished and the foliage dies back its time to top watering. You do need be careful when lifting as the Y shaped tuber is easy to damage.